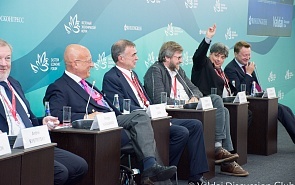 The TV debates of the Valdai Club on the Russia-24 channel within the framework of the Eastern Economic Forum in Vladivostok in many respects echoed the session of the Club that took place several hours earlier. The main theme was how Russia finds Asia in itself, overcoming historically established stereotypes and the traditional paradigm of thinking. Discussions about the European or Asian features of Russia last for centuries, but today they are not only anachronistic, but also have no special meaning. Honestly speaking, in the 19th century, when these discussions got the form of disputes between Westernizers and Slavophiles, Europe as a single community opposed to Russia existed only in the imagination of Russian thinkers. At the same time, the notion of a single "Asia", opposed to Europe, is a product of an equally archaic West European thinking, and it is wholly at odds with the modern world. But there are indisputable facts: Russia is in Europe and Asia, its culture and mentality is fed both from European and Asian sources, and the experience of Russia's interaction with the peoples of Asia is fundamentally different from the experience of Western European countries. The turn to the East, which began in recent years, placed two important tasks for Russia: to realize itself as part of Asia and to perceive its role in Asia. The sixth report of the Valdai Club series "Toward the Great Ocean", which presentation was held during the TV debates, is mostly devoted to the first task. The Asian component of identity for a long time was on the periphery of the Russian consciousness. According to Sergei Karaganov, Dean of the School of World Economics and International Relations, National Research University Higher School of Economics, Honorary Chairman of the Presidium of the Council on Foreign and Defense Policy, Russian history traditionally was the history of the European Russia. "You need to know your history, the history of Russian Asia, Siberia," he stressed. "We have a great Siberian history." In general, we know this history, objected Leonid Bliakher, Head of the Department of Philosophy, Pacific National University. According to him, the problem is that there are no popular texts written about it. As a result, Siberia and the Far East are presented as something separate in Russian internal discussions. The most important intellectual challenge, according to Fyodor Lukyanov, research director of the Valdai Discussion Club, is to place these spaces "in that part of our consciousness that is central". And here the question arises of knowledge and awareness of the inhabitants of the European part of Russia about the affairs in its Asian part. According to the participants, the Russian Asia gets little attention in the school history course, news from Siberia and the Far East is insufficiently covered in Russian federal media. All this prevents the perception that the Asian part of the country is also Russia, and Russia is also Asia. The lack of knowledge is also characteristic of the contemporary Russian perception of Asia, acknowledged the participants in the debate. It is necessary to "de-exsotize the East," said Timofei Bordachev, the programme director of the Valdai Discussion Club, director of the Center for Comprehensive European and International Studies at the Higher School of Economics. The audience warmly approved this thesis. According to the comments, Russia's interaction with Asia in the school program is limited to the narrative of two wars with Japan in the 20th century and the opium wars in China, and such a situation in teaching can be called catastrophic. Meanwhile, knowledge gives rise to understanding. According to Viktor Larin, professor at the FEFU Asia-Pacific Department, serious changes in attitude towards China began after the cross-year of China in Russia and Russia in China. He cited a curious fact: in relation to the Far East, China is most tolerant in the border city of Blagoveshchensk, where communication with the Chinese is the most consistent. At the same time, the expert is alarmed by the catastrophic lack of Orientalists in Russia. This is largely due to the lack of a long intellectual tradition - only the Vladivostok school of Oriental studies was closed three times, he complained. Nevertheless, it is necessary to be educated. It is necessary to adapt education to the understanding that we have a large and complex country, Fyodor Lukyanov stressed. Asian history played a role in the Russian history, and the Russian history - in the Asian one. According to Andrey Bystritskiy, chairman of the board of the Valdai Club Foundation, professor of the Higher School of Economics, an important means of education can be the study of languages, which will allow to perceive the culture of neighboring peoples directly. Perhaps, this is even more important than studying history, Bystritskiy said. During the discussion Stas Natanzon, host of the debates, led the participants to the fundamental question: What is the meaning of Russia’s pivot to the East? In the 1990s, Russia "turned to the West", the result was a bitter disappointment. Will the same happen again with the East? Answering the question, Leonid Bliakher noted, that modern Russia does not consider the turn to the East as a magical means, guaranteeing happiness. Unfortunately, in Europe a homogeneous front against Russia was formed, in Asia there is nothing like this. Turning to the East, Russia is gaining space for development. Sergei Karaganov pointed out, that Russia with its turn to Asia, even modest to date, has significantly improved its geopolitical position. Ten years ago Russia was the periphery of Europe, "a pupil willing to pay for discipleship." "When we considered ourselves to be under-Europeans, we were neither rich nor happy nor free," he stressed. Today we are establishing cooperation with a new center of power, which in 10-15 years will be the main source of money and technology in the world. This is a historic chance that Russia cannot miss."